The Fifth Element is an intergalactic horological weather station enabling accurate weather forecasting even when the power goes down. Four (UFO) elements: clock, barometer, hygrometer, and thermometer combine in a mother ship (with Ross, the alien pilot) to create an entity much larger than the sum of its parts: The Fifth Element. 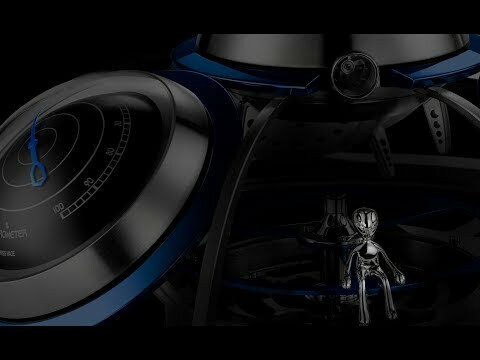 The clock, barometer, hygrometer, and thermometer are not only detachable and interchangeable; thanks to integrated support they can also stand on their own, returning to the mothership when required. Thanks to the Fifth Element’s own manually-wound, air-regulated movement, Ross rotates around the mothership’s cockpit checking that the skies are clear of both clouds and hostile invaders. The structure of the Fifth Element is milled from solid blocks of brass in a process taking many hours. Its large size makes manufacturing and decoration even more challenging. For over 175 years, L'Epée has been at the forefront of watch and clock making. Today, it is the unique specialised manufacture in Switzerland dedicated to making high-end clocks. L'Epée was founded in 1839, initially to make music box and watch components, by Auguste L’Epée who set up the business near Besançon, France. L'Epée is now based in Delémont in the Swiss Jura Mountains. Under the guidance of CEO Arnaud Nicolas, L’Epée 1839 has developed an exceptional table clock collection, encompassing a range of sophisticated classic carriage clocks, contemporary design clocks (Le Duel) and avant-garde, minimalist clocks (La Tour). Complications include retrograde seconds, power reserve indicators, perpetual calendars, tourbillons and striking mechanisms – all designed and manufactured in-house. Ultra-long power reserves have become a signature of the brand.